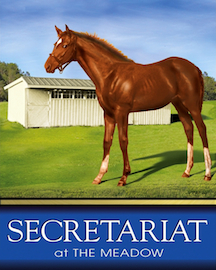 The annual Secretariat Birthday Celebration is Saturday, March 30, at his historic birthplace at the Meadow in Doswell, Virginia. This year, fans are invited to join in this fun-filled gathering to commemorate the birthday of “America’s Super Horse,” as well as the landmark 50th birthday anniversary of his stablemate Riva Ridge, known in Meadow lore as “the horse that saved the farm.” Both of these special champions were raised and trained at the famed and historic property. Kate Chenery Tweedy, daughter of the Meadow’s Penny Chenery, will headline the festivities with acclaimed sports journalist Steve Haskin as well as Steve Jordan, assistant to Secretariat’s trainer Lucien Laurin. These luminaries all had a front-row seat to the historical magic that was the Meadow during the early 1970s and will share their personal experiences and provide an insider’s perspective with guests. Co-hosting the event is Leeanne Meadows Ladin, resident historian and co-author of the award-winning books Secretariat’s Meadow – The Land, The Family, The Legend and Riva Ridge – Penny’s First Champion. Additionally, premium VIP tour options will be available. Kate Tweedy and Steve Haskin each will host a VIP tram tour (VIP tours now Sold-out) of the historic farm during the morning. Exclusive offsite visits via shuttle to the nearby private gravesite of Somethingroyal, Secretariat’s renowned dam, will also be available. Seating for the tours and Somethingroyal visits is very limited; UPDATE: Few Somethingroyal Visit Tickets left! The afternoon will highlight the story of Riva Ridge with a presentation and cocktail reception from 3 to 7 pm in Meadow Hall mansion. The aforementioned celebrity guests will each share in the presentation, providing a long overdue spotlight on the overshadowed champion. And the premiere of the new short film by John Tweedy will top off the tribute. The special event will culminate with the live televised broadcast of the Florida Derby, with Mr. Haskin offering his picks and analysis of the race along with his popular “Derby Dozen” commentary of potential Kentucky Derby contenders. The Secretariat Birthday Celebration has become an honored tradition for Big Red fans who gather together in Virginia to enjoy the many festivities held in the Meadow’s historic and pastoral setting. The Meadow Event Park is located 30 minutes north of Richmond, off I-95 at Exit 98 (Doswell), 1.5 miles east of King’s Dominion theme park. For those traveling in for the event, a diverse selection of accommodations can be found in the charming nearby community of Ashland. Special Birthday Celebration rates are being offered at the Henry Clay Inn, Hampton Inn, Country Inn and Suites, and the Quality Inn. Tickets are now on sale. For more information please visit the Meadow Event Park website.